Corinne Demas's remarkable donkey poems are "really" about the sensitivity to the lives of other creatures that defines our own humanity. Along the way are comical, whimsical, and -- yes -- even a few sentimental moments. I'm reminded of a neo-Franciscan prayer I read a while ago: "Dear Father, hear and bless your beasts, and singing birds. And guard with tenderness small things that have no words." Author of Unreconstructed: Poems Selected and NewAside from C. K. Chesterton's well known religious lyric, "The Donkey," donkeys have not figured notably in poetry. This collection begins to fill that gap in an engaging way. Corinne Demas's animal portraits are full of shrewd and sensitive observation; and like all thoughtful animal poems, they have something striking to tell us about the human animal as well. 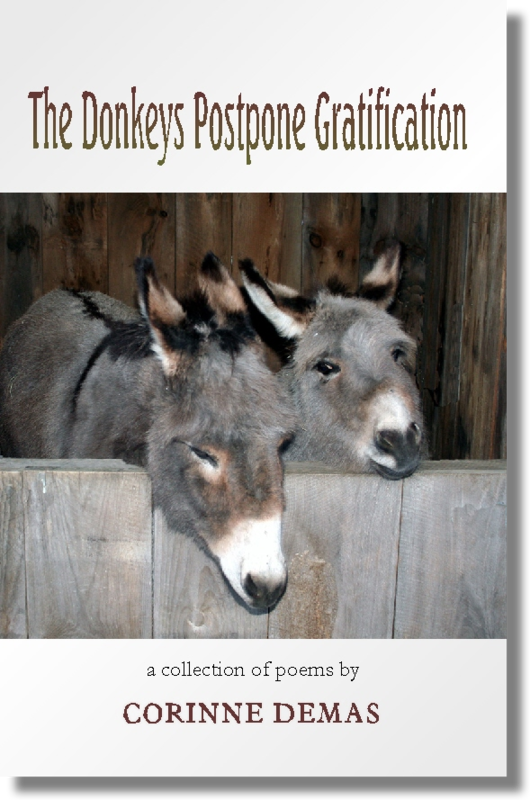 The Donkeys Postpone Gratification is a wonderful book about three gentle creatures: two beloved donkeys, and the woman who cares for them. though she can never know quite what they're thinking, the narrator of these fine poems imagines a rich inner life for her donkeys, and the reader of these poems is all the richer for it. This book will easily become a classic alongside May Sarton's The Poet and the Donkey and William Steig's Sylvester and the Magic Pebble. Why do you have donkeys, we'd ask Corinne Demas. Now we know. So she could write this dream sequence of poems. The donkeys become muses for a poet who explores consciousness and memory, who deliciously details the seasons and the corralled world. Humor, wistful speculation, heartbreak: it's all here. She takes the very predictable actions of these more diminutive members of the equine family and with subtle additions of intent or observation turns them into a microcosm of human action and reaction….These poems are beautiful. They are accessible. And like her other work, they are tender and hopeful. Because animals seem to live so completely in the moment, they are a natural palette to draw emotional truth from….Demas has a strong command of language and never falters in her portraits of these furry beasts and the attention they bring to their days….Each simple poem in the book is a blessing, a captured drop of time keenly observed, a crystalline bit of life. A woman observes the oddly human behavior of her two donkeys through the daily tasks of caretaking, sharing their wonder as they interact with the world. A clementine, an ice storm, and a sheared dog are just a few of the things that evoke moments of tenderness and realization in this collection of narrative poems.